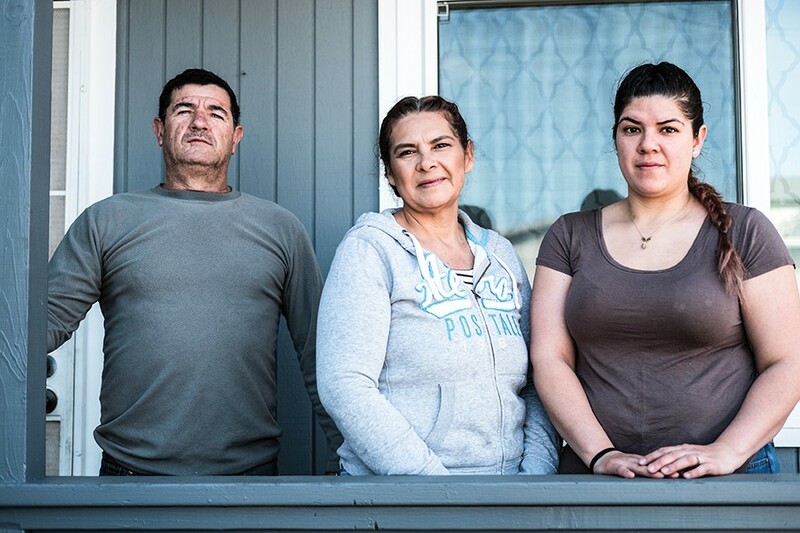 Tenants Rafael Munoz, Ana Macias, and Elia Mares confronted their landlord at his office after he notified them that their rent would increase by more than $1,000 per month. One morning in February, tenants of an East Oakland fourplex, along with about a dozen activists, drove in several cars to an office park near San Jose to confront their landlord, David Lawver, about recent rent hikes of more than $1,000 per month. Elia Mares, 26, whose parents and newborn child rode in the backseat of her car, said her family was initially skeptical of the tactics proposed by the activists who helped organize the day's action. "We thought things don't get done by screaming and marching," she told me as she drove. "But we went to some meetings and got some hope. My mom, she hurt her knee recently, but she cancelled a doctor's appointment to do this. She said, 'I'd rather walk in pain.'" The tenants arrived unannounced at the office of Kal Financial, a mortgage brokerage firm founded by Lawver, and quietly crowded into the lobby. Lawver, who'd refused to meet since notifying them of the rent increase, emerged from the office and engaged some of the tenants for about 10 minutes. He said that their lawyers should get together, and that the tenants should petition Oakland's rent board. "You gotta understand, I wrote a million-dollar check," he said, referring to his purchase of the building. "We called our attorney and he said, 'Well, this isn't a rent-controlled building, so you can just raise it to market rate.' And that's what we did." "Legally, you can raise the rent to whatever you want," responded Justin Tombolesi, an organizer with nonprofit advocacy group Alliance of Californians for Community Empowerment. "You can also make an agreement with your tenants for stable rent that keeps them in their home." After that, Lawver seemed somewhat open to negotiating the rent hike and agreed to meet with the tenants the next week. Outside, the tenants and activists debriefed. "He already compromised," said Tombolesi. "We got a meeting when before he said he wouldn't meet." There were murmurs and a bit of applause, and then a chant: ¡Sí se puede! The Spanish-speaking families in the 34th Avenue building say that the planned rent hikes — if they go through — will displace them from the community in which they've long worked and attended school. And such large rent increases are an epidemic in East Oakland, according to Tombolesi. He said that since last year, ACCE has helped eight groups of tenants successfully strategize ways to pressure their landlords to withdraw or renegotiate rent increases. The idea is that, without rent control, tenants' only recourse is direct action. At the same time, organizations such as ACCE are mobilizing communities plagued by aggressive rent hikes to support a statewide ballot initiative this November to repeal Costa Hawkins, a California law that limits cities' ability to expand rent control. "Part of the organizing is connecting tenants' situations to this broader struggle," said Tombolesi. "But honestly, once we brought it up, it's really been the initiative of tenants to push for it becoming a ballot measure." Mares said her family first reached out to the property manager Leslie Kanis, a business partner of Lawver's in a limited-liability company called Oak 19. According to county records, Lawver and Kanis have bought and resold more than a dozen properties in East Oakland through their LLC within the past year. "[Kanis] told us there was no way we could meet with [Lawver]," recalled Mares. "And she said this is fair rent." Lawver told the Express that he hasn't done anything wrong. "It's not about bad guy landlord," he said. "It's about fraudulent tenants." Regardless, after the sale, the tenants continued to pay Lawver about $1,500 for several months before he notified them of larger increases. Lawver said that, for now, he's willing to accept $2,200 a month from the tenants but that he's decided he won't negotiate collectively with the group — despite indicating at his office that he would do so. He added that he thinks the situation will "turn into a nasty lawsuit between the tenants and the seller and me." Lawver retained a San Jose law firm that specializes in real estate, Pahl & McCay. In a letter addressed to Tombolesi dated March 7, attorney Servando Sandoval warned that "we consider your actions to be harassing and in violation of the law." It reiterated that Lawver won't meet the tenants. "Our client has the legal right to impose rent increases." It goes on, "[Our client] will not have any group discussions, as such discussions are not productive." The Fruitvale district fourplex is exempt from rent control because of the Costa Hawkins Rental Housing Act. It prohibits cities and counties from applying rent control to single-family homes and any units built after 1995, unless a city already placed the cutoff earlier. So, Oakland's rent control only covers buildings with two or more units built before 1983, when the city enacted rent control. The 34th Avenue building was built in 1989. The fourplex is protected by Oakland's "just-cause" ordinance, which limits landlords' ability to evict to certain circumstances, but there's nothing to stop Lawver from effectively forcing tenants out through rent hikes. On March 10, approximately 50 people gathered on a plaza near Fruitvale BART Station beneath a banner reading, "Rent Control for All, Repeal Costa Hawkins." At either end of the rally were volunteers in ACCE shirts with clipboards, gathering signatures. The proposed initiative to repeal Costa Hawkins — supported by ACCE and statewide organizations such as Tenants Together — needs 365,880 valid signatures by April 24 to land on the ballot in November. Organizers with ACCE say they're on track to qualify. Tombolesi rolled up a loudspeaker, and tenants told their stories: Billy Martin said that Michael Marr, an Oakland landlord recently busted for rigging foreclosure auctions, increased his rent from $800 to $1,500. Norma Sanchez said that her new landlord, who also owns seven other single-family homes, raised her rent from $1,200 to $2,400. "We're here because our landlord wants to increase our rent by $1,200," said Rafael Luna, a ten-year tenant at 34th Ave. "Our family's going to be devastated if we have to move."